The family of the late Byanyima see him off. Courtesy. MBARARA. 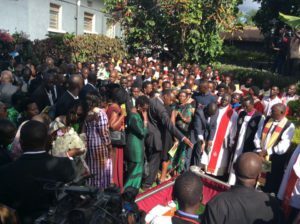 A three-gun salute and a thousands of mourners bid a befitting farewell to Mzee Boniface Byanyima today closing an illustrious political chapter of a man whose life will always be closely intertwined with past and present politics of the country. Byanyima who passed on on Tuesday at the age of 97 was laid to rest at his home in Ruti village in Mbarara District at a burial ceremony attended by public officials, politicians, thousands of other mourners, among others. Police officers carry out the three-gun salute ceremony at the burial today. Countesy. The former Democratic Party national chairman lived a life politically and personally intertwined with that of President Museveni. Byanyima was the foster father of the President, who he reportedly took in at a young age. Byanyima is also said to have paid fees for Museveni’sformative education. On Wednesday, Museveni ordered the Government to prepare for him a State funeral. However, the President did not attend the late’s funeral or burial as he is in Dar-es-Salaam, Tanzania, for East African Community heads of state summit.